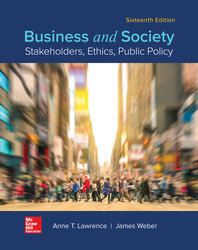 In a world economy that is becoming increasingly integrated and interdependent, the relationship between business and society is becoming ever more complex. The 16th edition draws on the latest research to address the challenges facing business organizations and their stakeholders. The text builds on its legacy of market leadership by reexamining central issues.